Merv Thomas (trombone and vocals) a prominent bandleader in Auckland for many years, presents his quartet with John Wilcox (piano), Bruce King (drums), and Glyn Frewin (bass). 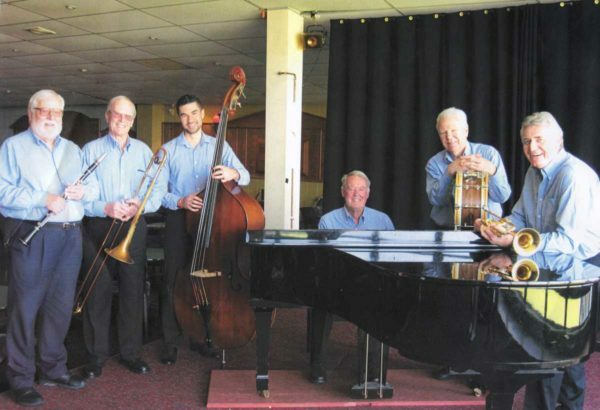 Merv has featured in the Merv Thomas Dixielanders at the Crystal Palace in the 1950s and 60s, a sextet on Auckland's waterfront in the 1970s and the Queen City Big Band. John Wilcox a talented professional pianist has been contributing to Auckland jazz groups since the 1960s, He was founder of the Bridge City Jazz Band and is renowned for his keyboard skills. Glyn Frewin and John have played together for many years, and Glyn, a composer and songwriter, is now part of the Bridge City Jazzmen, and the Merv Thomas Quartet. Bruce King has been a leading drummer in Auckland for over 50 years. Highlights of his career include performing with the Swingsters, touring with the Stereotones, backing Vince Callaher, touring with the Howard Morrison's "Showtime Spectacular", the Auckland Neophonic Orchestra and performing with Al Hunter and on the "Highway of Legends" tour. We are looking forward to a relaxed afternoon of top quality jazz.